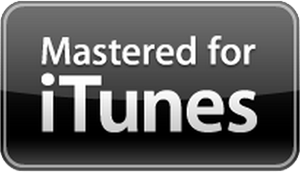 On your travels around the iTunes Store you may have noticed the Mastered For iTunes logo next to certain releases. Ever wondered exactly what this means and how you can get your music sounding better than ever on iTunes? Ok folks, step this way and all will be revealed!…. So basically, Apple recently embarked on its Mastered For iTunes initiative and Loft Mastering is proud to be among their elite group of approved facilities. The main aim here is to significantly improve the quality of the audio available from iTunes. Thankfully, Apple have now kindly provided us with a great way to achieve this. Working with Apple and incorporating specialist mastering tools into our workflow, we are able to ensure that this new MFiT specification is strictly adhered to. These tools enable us to test and approve the MFiT encoding prior to sending your masters for final processing at Apple. Using their bespoke/flagship codec ‘AAC’, developed with the Fraunhofer Institute, iTunes now offers incredible fidelity with low file sizes. Using their new 2 step encoding process Apple are able to offer a higher quality encode from a higher resolution 24 bit file, as opposed to traditionally encoding from 44.1 kHz 16 bit (CD quality) audio. The results are impressive. Here at Loft Mastering we can optimise your music for iTunes so that it sounds fantastic when encoded to Apple’s new AAC format. If you’d like to hear how good your music can sound on iTunes feel free to give us a shout…we’d love to hear from you.